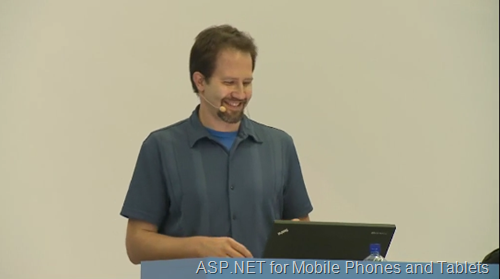 I was outside Moscow last week speaking at Microsoft DevCon 12 in Russia. They did a great job with the event and not only filmed everything but did picture in picture as well as real-time translation into Russian. It was also live streamed at the team and later edited for download. Very cool. Big thanks to the team for putting the videos up so fast! The English versions of my three talks (plus one open Q&A sesssion) are now all up for your viewing pleasure. If it seems I'm speaking ever so slightly slower than usual, that was at the request of the translators, and is a good practice when speaking English to non-native speakers. You can also download and view the Russian versions if you like as well. You got skinny. Bold move, friend. Wait a second, are you saying that I was totally fat before?!? In Soviet Russia, computer programs you. Downloaded them all, thanks for posting them! Lookin' good brother, keep it up! I was looking for these. 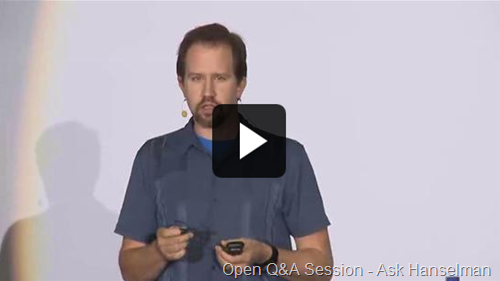 Time for pearls of Wisdom in ASP.net and programming in general. Can we implement SignalR in existing systems like Ticket Booking website. how much impact will be on the existing system. Or is it recommends only new system? First all caps and now skinny Hanselman? Whats going on in Microsoft? Hi Scott, thanks for nice presentations! Already loving the Media Query tips! Thanks for posting these ! I immediately watched the SignalR talk. I was mortified that the very last comment of the talk at the end of the questions was cut off. It was about using VS to put JSON into a class. I have been wanting to return a view and data in one call. I will then put the data into a Knockout Model and the view will be the template. 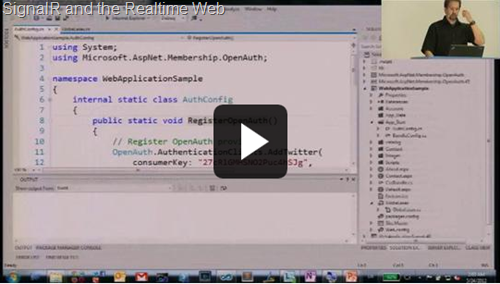 Scott, is it possible to download the code from the SignalR presentation? The one with monkeys in it. I was wondering if it would be possible to download the sources from the first video, where you show the application with the cache manifest on the end. I really would like to use that as a reference project. Whoa, whoa, whoa! Wait a sec. What was that about external logins and OAuth v.Next at the very start of the SignalR prez and how do I get a hold of that video please? With no MIX 2012, what is the one conference we should try to attend. Due to budget, we can only go to one. Would be great if it is one you're presenting at. Did anyone ask you why Azure was avauilable in Ecuador, but not in Russia? Sorry using a comment, but I think you're probably the best person to ask. Is there and updated version to this "retired content" on performance from P&P group? I have recently started following your blog and I am in love with it. I only have one question why not have these videos of yours in youtube too ?